I know what you are thinking...this is not a Thanksgiving recipe...but it would be great for a holiday cocktail party! Fairly simple and very delicious, once fried these can stand uncovered on a sheet pan or wire rack at 250 to keep warm, making them great for entertaining and allowing enough time to dispose of the oil and batter and clean up. Heat oil to frying temperature - about 390 (because it will cool down once food is placed in it and you want about 375 to fry) - or to the setting of your deep fryer. Butterfly shrimp by cutting them in half almost all the way through, but not enough to cut into 2 pieces. You are just trying to split open the shrimp and increase it's surface area. Dredge in cornstarch, shake off excess. Meanwhile, mix equal parts cornstarch and flour in a bowl with water to create a thick batter - you want a consistency similar to pancake batter, perhaps a bit thinner. Season well with salt and pepper. Lay out coconut in a flat bowl, dish or plate. Season well with salt and Old Bay seasoning. Dip dredged shrimp in batter, letting excess pour off. Coat with coconut. 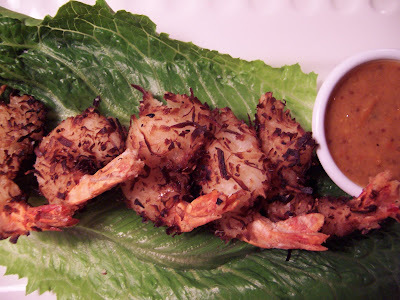 Repeat with all shrimp, then fry in batches until coconut is toasted and golden brown. If, like me, your shrimp aren't done but the coconut is brown, bake in a 350 oven until shrimp and batter are cooked through. For sauce, mix all ingredients to taste, serve with shrimp. I think a holiday recipe is better right about now...since most people should hopefully know what they are having tomorrow! Yum, that looks divine. I'm not a huge fan of orange marmalade. I'd probably serve it with a sweet-spicy thai dipping sauce. But it looks great. This looks so good! Joao is crazy for shrimp! I love shrimp and these look sooo good. The dipping sauce sounds so interesting, I am curious to try it myself. Looks good. I really like the sound of the coconut shrimp. We are having our annual Christmas party with friends next week and I was looking for a good seafood appy. This might be it. It sounds wonderful! This looks wonderful! I always order this when I go to certain restaurants, but never made it at home. hmmm...Maybe its time to! 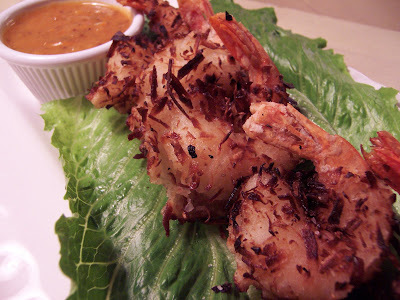 Coconut shrimp is one of my favorites, but I have never tried it myself. This looks simple enough, and sounds delicious! And Costco has the best jumbo shrimp on Fridays and Saturdays! This does sound great for a cocktail party... I'm adding it to my entertainment recipe box! I love a good shrimp recipe, this looks delicious!